Sorry for the washed out picture! I didn’t realize that the picture quality of this swatch wasn’t that great when I uploaded this. I have another polish from Zenorah to show you guys today. I know I mention her all the time, but she is one of the best friends that I have met while doing YouTube videos and blogging. On the off chance that you haven’t seen Zenorah, you can check out her blog here! But almost a year ago we did a swap, I sent her some US nail polishes and makeup and she sent me some Canadian brands. This was another polish she sent me, that I can’t believe I’ve waited this long to try out! In the bottle I wasn’t sure if this was going to be my color, but once on the nail this polish seriously shines! Quo is a brand by Orly that I can’t get in the states, and this was the second Quo polish that Zenorah sent me. 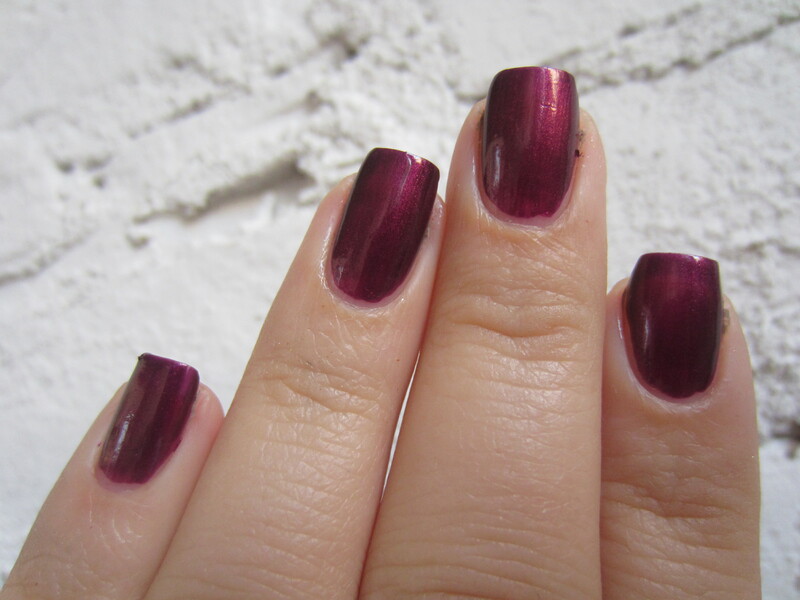 Quo “Mystic Night” is a deep magenta metallic polish. I absolutely love this shade! I don’t know if its just the color of the season for me but I’ve been loving these deep magenta’s and berry tones for fall. I was a little worried about the finish being a little streaky since it is a metallic, but it isn’t in the least. It kind of looks like magenta wrapping paper. The formula was amazing as well. Its opaque in 2 coats, but you might be able to get away with 1 thick one. Like I said, this isn’t streaky at all so you don’t have to worry about how you apply it. The formula is a little on the thin side, but I don’t mind since its so pigmented. The dry time was really quick as well. No complaints! I really like this shade and I keep thinking of all the glitters that would go with this for the holidays. What do you guys think? Have any of you tried this brand? Do you like these jewel toned metallic shades? When I saw this in store, I knew this would look flipping GORGEOUS on you and I was right!! now i am so tempted to go and get this!! And it definitely reminds me of the holidays too but i wanted to get you one that isn’t the typical red or dark shades cause those are predictable for the holidays so i went for one that can’t be duped easily. I think with a glitter on top you would have be drooling!!! its perfect for the holidays!!! thank you again this polish is stunning! its so pretty! i’m so jealous of you guys up in canada that can get these polishes! and the quo you sent me is just as stunning! thanks! can you get quo in holland?